You have to [taste] it for yourself”. 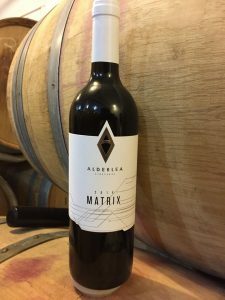 This month we released the 2014 Matrix with our new label and branding. 2014 was a hotter year than 2013, resulting in a rich blend of ripe fruit complemented by six months in a French oak re-coopered barrel. This wine is perfect for pairing with hearty meat dishes and other winter fare. 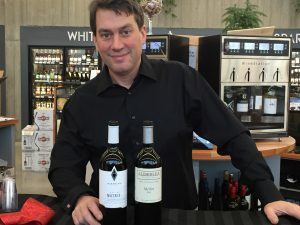 We featured the new Matrix along with our 2015 Merlot at a tasting at the Tudor House Liquor Store in Victoria. Many thanks to Jacques and Marta at the Tudor House for the opportunity to pour these two wines. As we approach year end, we reflect on all that we’ve accomplished at Alderlea since taking the reins in late April this year. In addition to learning the ropes in the vineyard, we developed our new logo, label, website and social media presence on Facebook and Instagram. We created the Plaid label and participated in weekly summer farmers’ and Christmas markets. We had the pleasure of meeting loyal clients and welcoming many friends to our vineyard and tasting room throughout the year. It has been a great adventure thus far, and we look forward to continuing our journey in 2018.